All campers receive an evaluation form intended to aid individual player improvement. Counselors grade a player’s overall skill. Certificates are also part of the package. Each player receives a merit form of completion. 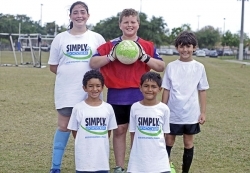 Simply Soccer Camp is probably the only camp with a World Cup Tournament of its own. All players are divided into teams on the last day of a fun-filled camp. Teams compete for seeding and the distinction of being Simply Soccer’s World Champs for the week. Winners receive camp keychains and all campers receive The Official Simply Soccer Tee Shirt ©. Simply Soccer Camps prides itself on the skills and attention to detail on the part of its counselor/coaches. Sometimes it looks as though the coaches are having just as much fun as the kids are. Coaches will create a “fun environment” where its participants will perform certain skills without being told the specifics surrounding the technique. In other words, a player will do a technique where it is merely a reflex since the Simply Soccer staff would have him/her perform the technique in a variety of ways throughout the camp.